Keyboard shortcuts are, perhaps, one of the Excel topics that virtually any user can (or should) be interested in. Keyboard shortcuts are extremely useful for purposes of improving your speed and productivity when working with Excel. Not knowing the right keyboard shortcut means that, instead of quickly typing the relevant key combination, you need to (i) lift your hand from the keyboard, (ii) reach for the mouse in order to do what you want, and (iii) return to the keyboard. In the most recent versions of Excel, keyboard shortcuts allow you to work with virtually every command or feature by using the keyboard. Regardless of your level of Excel knowledge, you can always learn a new shortcut and, considering the huge amount of Excel keyboard shortcuts that you have available, is likely that you'll never memorize them all. I have already created, and update from time to time, one of the most comprehensive lists of keyboard shortcuts available online. You can find this list of keyboard shortcuts for Excel here. The list is also available for download as a free PDF file called Excel Shortcuts and Hotkeys: The Power Spreadsheets Cheat Sheet. If you want to get the data from the PDF file into Excel, you can use any of these conversion methods (which you can also implement with macros). Reason #1: Regardless of how comprehensive a keyboard shortcut list is, it's extremely difficult to map absolutely all of the keyboard shortcuts available in Excel. You may find that, from time to time, even massive keyboard shortcut resources (like my cheat sheet) don't list the keyboard shortcut for the precise item you need. Knowing how to find or create a keyboard shortcut by yourself can be quite valuable in these situations. Reason #2: Keyboard shortcut lists and cheat sheets only include the built-in default keyboard shortcuts of Excel. This leaves out the options you have for creating custom keyboard shortcuts in Excel by using the Quick Access Toolbar or macros. Reason #3: Most of us don't want or need to learn absolutely all the keyboard shortcuts that exist in Excel. Even if we tried to learn them all, is likely that only a few of us would succeed. Lists and cheat sheets with keyboard shortcuts are great. Most of us want to have them and, as I show below, lots of Excel bloggers and writers (including myself) have created their own version of them. These amazing lists can, however, be slightly overwhelming if you don't know how to approach them. More precisely, if you approach keyboard shortcut cheat sheets with the idea that you'll quickly learn them all by heart, you're likely to be disappointed. This isn't a bad thing. After all, you probably don't need to know so many keyboard shortcuts. Furthermore, some of those shortcuts may be for commands or features that you rarely use. And if it makes you feel better, you're in good company. You can rest assure that most other Excel users (including very advanced ones), don't know all the shortcuts either. Don't overload yourself by trying to learn too many keyboard shortcuts at the same time. You're unlikely to learn a huge amount of keyboard shortcuts in a very short period of time. I suggest you start slowly and, perhaps, learn 1 or 2 shortcuts per week. Once you've mastered a particular shortcut, learn a new one. As you start gaining more familiarity with Excel keyboard shortcuts, you'll be able to handle more. You'll notice the list of keyboard shortcuts you know and use grows consistently over time. Step #1: Identify commands or tasks that you constantly execute while working with Excel. Just determine what works for you. Step #2: Search and find a keyboard shortcut that allows you to execute that particular command or task. Option #1: Check out a list of keyboard shortcuts prepared by somebody else. I share several of such lists below. Option #2: Find a built-in keyboard shortcut or, if there's no suitable option, create your own keyboard shortcuts. This option #2 is the topic of this blog post. I have already created (and update from time to time) a very comprehensive shortcut list that helps you with option #1. However, depending on factors such as the type of command or tasks you need to execute and your own personal preferences, the keyboard shortcuts included in such lists may not (for different reasons) work for you. Fortunately, Excel provides several options for you to carry out a task or execute a command by using only the keyboard. In addition to the huge amount of built-in keyboard shortcuts that Excel has, you can create your own custom keyboard shortcuts (taking into consideration some requirements and limitations that I explain below). The following section may help you avoid confusion with the, sometimes, irregular terminology used by different authors when talking about keyboard shortcuts. If you aren't interested in this particular topic, or already have a good grasp of the topic, please feel free to skip to the next section, which talks about regular keyboard shortcuts. Keyboard Shortcuts: I generally use the term “keyboard shortcuts” to refer to the combination of keyboard keys that allows you to carry out a particular task that usually requires the use of a mouse. In some contexts, you may see the term “keyboard accelerators” being used to refer to all of such combinations, while the term “keyboard shortcuts” is reserved to the type of keyboard shortcuts that I refer to as regular keyboard shortcuts. I explain how you can turn on Key Tips, and use them to work with the Ribbon and the Quick Access Toolbar in the sections below. Difference #1: As shown in the image below, Hotkeys are displayed as an underlined letter. Key Tips, as explained above, are displayed as labels or badges. Difference #2: Hotkeys are generally displayed within dialog boxes. Key Tips are displayed in the Ribbon and the Quick Access Toolbar. The following screenshot of the Paste Special dialog box provides an example of how Hotkeys look like. The arrows point to some of the underlined letters within this dialog box. I explain how you can work with Hotkeys and dialog box keyboard shortcuts below. The terms listed above are, however, not necessarily used in exactly the same way by other Excel writers or documents. A possible variation of the terminology, for example, involves using the terms “Hotkeys” and “Key Tips” interchangeably. Sometimes, authors use the term “keyboard accelerator” to refer to the keyboard shortcuts that you use when interacting with the Ribbon, the Quick Access Toolbar or dialog boxes. These are what I refer to here as Ribbon keyboard shortcuts, Quick Access Toolbar keyboard shortcuts and dialog box keyboard shortcuts. Since Key Tips and Hotkeys (as explained above) appear when you use keyboard shortcuts to work with the Ribbon, the Quick Access Toolbar and dialog boxes, you may see the term “keyboard accelerators” instead of Key Tips and Hotkeys. Once you've read this Excel tutorial, you'll have enough knowledge to understand other texts that talk about keyboard shortcuts. Therefore, you'll easily figure out how the relevant author is using each term. When talking about keyboard shortcuts for Excel, most people refer to Ctrl combination shortcut keys. “Ctrl + B” to apply or remove bold formatting. “Ctrl + C” to copy. “Ctrl + V” to paste. For example, you can use “Ctrl + 1” to display the Format Cells dialog box, “Ctrl + 5” to apply or remove strikethrough formatting or “Ctrl + [” to go to the direct precedents within the active worksheet. Ctrl + Shift + Additional Key. Some examples of such keyboard shortcuts are “Ctrl + Shift + !” (also expressed as “Ctrl + Shift + 1”) to apply number format or “Ctrl + Shift + A” to insert function arguments (when the function name has already been typed and the insertion point is to the right of the function name). Ctrl + Alt + Additional Key. Perhaps my favorite keyboard shortcut following this form is “Ctrl + Alt + V”, which displays the Paste Special dialog box. There are, however, additional keyboard shortcuts that aren't Ctrl combination shortcut keys. “Shift + Arrow Keys” extends the selection by 1 cell or, within a cell, selects the character to the right or to the left of the insertion point. “Shift + F10” is the equivalent of right-mouse button click. In other words, it displays the context menu for the selected item. Tab, among other functions, selects a suggestion provided by the autocomplete feature to complete a formula and move one cell to the right or to next unlocked cell. “Alt + Page Down” and “Alt + Page Up” take you 1 screen to the right or 1 screen to the left of the current active sheet. When a row or column is selected, “Right-Mouse Button + E” inserts copied or cut cells. Within a dialog box, the Spacebar performs the action that corresponds to the selected button, or selects or clears a checkbox. As you can see, these are plenty of different regular keyboard shortcut combinations. All of the keyboard shortcut examples I provide above are (i) for Excel for Windows and (ii) using the English (USA) keyboard layout. If you're using Excel on a computer that doesn't meet these 2 requirements, there will (likely) be some differences in some keyboard shortcuts. For example, if you're using Excel for Mac, some of the Ctrl combination shortcut keys that Excel for Windows has don't work. If you're interested in lists or cheat sheets with the actual keyboard shortcuts, you may be interested in Excel Shortcuts and Hotkeys: The Power Spreadsheets Cheat Sheet. This is my compilation of keyboard shortcuts, which I update from time to time. In addition to the actual blog post, you can gain immediate free access to the PDF file containing that list. Excel's Ribbon is the group of tabs and buttons that you see in the upper section of Excel. If you've used Excel before, you probably know that you can use the Ribbon to carry out the most common tasks in Excel. In fact, my guess is that you use the Ribbon constantly. Also, if you're like most Excel users, you probably use the mouse to work with the Ribbon (at least most of the time). At first glance, you may think that the Ribbon is completely mouse centric (…). But in fact, the Ribbon is very keyboard friendly. In this section, I explain what you need to know in order to work with the Ribbon using these Ribbon keyboard shortcuts. Press the first key and let it go. Press the second key and let it go. And continue pressing and releasing the relevant keys that compose the keyboard shortcut. Now that you know this, let's take a look at the 3 easy steps you can follow to use Ribbon keyboard shortcuts. After explaining these 3 steps, I show you an example of how you can use Ribbon keyboard shortcuts. Remember that you don't need to hold down these keys while carrying out the next steps below. Once you've turned Key Tips on, Excel displays the keys that corresponds to each Ribbon tab, the Backstage View (whose Ribbon label is “File”) and Tell Me (whose Ribbon label is “Tell me what you want to do”). Tell Me was introduced in Excel 2016. Therefore, if you're using Excel 2013 or earlier, you won't have access to this feature. You may not see some of the tabs that are displayed above. This may be the case, for example, if you don't have the Developer tab enabled. You may see additional tabs. This may be the case, for example, if you have selected an object (such as a chart) and, as a consequence, Excel displays a contextual tab. For example, I took the following screenshot when a chart is selected. Notice the 2 additional tabs (Design and Format) which you can access by pressing “J + C” (Design) and “J + A” (Format). You may not see the Tell Me feature. This is the case if you're using Excel 2013 or earlier. The screenshot above was taken using Excel 2016. However, the Key Tips for the Ribbon tabs remain the same. In other words, “Alt + H” always takes you to the Home tab, “Alt + N” always takes you to the Insert tab, and so on. Press the key(s) that corresponds to the section (usually a tab) of the Ribbon you want to activate. Displays a new set of Key Tips that show all of your new options. In some cases, a Key Tip may display 2 keys. In such situations, just press both keys. In the case of the Design and Format tabs above, this means pressing “J + C” or “J + A”. If Excel displays a new set of Key Tips, just repeat this step #3 (press the appropriate keyboard key) as many times as necessary until you've reached your desired destination. Remember that you don't need to keep any key depressed while typing the other keys that compose the Ribbon keyboard shortcut. Notice how the Key Tips displayed by Excel no longer correspond to the Ribbon tabs, as shown in step #2 above. The (many) Key Tips in the image above correspond to the different buttons, drop-downs and dialog launchers in the Home tab. In other words, if you want to execute the Increase Indent command using Ribbon keyboard shortcuts (or Key Tips), the full shortcut is “Alt + H + 6”. The image shows the whole process of using keyboard shortcuts to access a command in the Ribbon. In this case, I'm adding all borders to cell D2, which I select at the beginning of the recording. The full Ribbon keyboard shortcut for adding all borders is “Alt + H + B + A”. Notice that, in this case, I need to press 4 keys (Alt, H, B and A) in order to achieve the desired result. In the example within the previous section, I only needed to press 3 keys (Alt, H and 6). Rule #1: Turn on Key Tips by pressing Alt or F10. Rule #2: Use Key Tips to determine the key(s) that corresponds to the section of the Ribbon (for example, tab or button) that you want to go to, and press that key (or key combination). (…) Excel automatically assigns hot-key letters to each of the custom tabs and commands you add to the Ribbon. Microsoft introduced the Ribbon in Excel 2007. Previous versions used a menu-based navigation, similar to the Visual Basic Editor. These older Excel versions also have their own system of shortcuts. As explained by Microsoft, several of these keyboard shortcuts continue to work. However, if you choose to work with these keyboard shortcuts, you must know them by heart. Excel displays no Key Tips. In fact, whenever you start typing one of these keyboard shortcuts, Excel enters into Office 2003 Access Key mode and displays a message stating that you're using a menu key sequence from a previous version of Excel. This message also displays the letter(s) of the keyboard shortcut that you've already typed. The following screenshot shows this looks like after I've typed “Alt + T”, which corresponds to the old Alt + Menu keyboard shortcut for the Tools menu. In my opinion, if you're currently learning keyboard shortcuts, it's a better idea to use one of the other keyboard shortcut types I explain this Excel tutorial. The old Alt + Menu keyboard shortcuts are better suited, as explained in Excel 2016 In Depth, for “power users” who “have a few of these commands memorized”. If you've worked with previous versions of Excel and already know some of these old keyboard shortcuts, or are interested in rediscovering them, you can refer to Mr. Excel's (Bill Jelen's) Excel In Depth books. These books usually include a comprehensive list of these old Alt + menu shortcuts that continue to work in newer versions of Excel. Several commands don't make sense in the framework of Excel 2016, so they have been deprecated. However, you shouldn't be too worried about typing an old Alt + menu keyboard shortcut that no longer works. If you try to do this, and the command indeed doesn't work in the newer version of Excel, Excel generally doesn't do anything. In other words, nothing happens. I actually continue to use some of these old Alt + menu keyboard shortcuts myself. For example, I normally use the keyboard shortcut “Alt + T + O” to display the Excel Options dialog box. The following image shows how Excel looks like while I use this keyboard shortcut. Notice, in particular, the message displayed by Excel at the top of the screen and the lack of Key Tips. The Quick Access Toolbar is the toolbar that, by default, appears on the upper left corner of Excel (just above the Ribbon). If you're working on a touch-enabled device, the button for the Optimize Spacing Between Commands command may also appear. Characteristic #1: The Quick Access Toolbar is customizable. As a consequence of this characteristic, you can add or remove commands from it. Characteristic #2: You can easily access the commands in the Quick Access Toolbar using keyboard shortcuts. The reason for this is that Key Tips (which I introduce above when talking about Ribbon keyboard shortcuts) also help you to access any command within the Quick Access Toolbar. One of the main consequences of these 2 characteristic is that you can use the Quick Access Toolbar to create custom keyboard shortcuts for almost any Excel command. As I explain above, you can use Key Tips to access any command in the Ribbon. The same applies to the Quick Access Toolbar. Step #1: Press Alt or F10 to turn on Key Tips. Step #2: Use the Key Tips displayed by Excel to determine the key that corresponds to the item (usually a command) of the Quick Access Toolbar that you want to select, and press it. The Quick Access Toolbar is independent from the Ribbon tab currently being displayed. Therefore, the Quick Access Toolbar is (almost) always visible, regardless of which Ribbon tab is currently displayed. Quick Access Toolbar keyboard shortcuts are shorter than Ribbon keyboard shortcuts. Key #1: Alt or F10. Key #2: The key corresponding to the relevant Ribbon tab. Key #3: The key for the relevant command. In several cases, the shortcuts are longer and include more than 3 keys. For example, applying cell borders (as in the example I show above), requires you to press 4 keys (Alt, H, B and A). Factor #1: The amount of buttons your Quick Access Toolbar has. Factor #2: The location (within the Quick Access Toolbar) of the relevant command. In any case, the organization of Quick Access Toolbar keyboard shortcuts is quite intuitive. More precisely, the number and letter (where applicable) of a keyboard shortcut is determined by the position of the relevant button in the Quick Access Toolbar. The first 9 commands of the Quick Access Toolbar are numbered between 1 and 9. Notice how, in the screenshot displayed above, the 3 commands (Save, Undo and Redo) are numbered 1, 2 and 3. The complete keyboard shortcuts for these buttons are “Alt + 1” through “Alt + 9”. Commands 10 to 18 of the Quick Access Toolbar are assigned a 2-digit number, starting with 09 and going down to 01. In other words, these keyboard shortcuts are “Alt + 0 + 9” through “Alt + 0 + 1”. Commands 19 to 45 have keyboard shortcuts where the second key is always a 0 and the third key is a letter ranging from A to Z. In these cases, keyboard shortcuts range from “Alt + 0 + A” to “Alt + 0 + Z”. Notice how the keyboard shortcuts follow the general rules described above. The keyboard shortcut for the first command on the left is “Alt + 1”. The keyboard shortcut for the last command on the right is “Alt + 0 + Q”. Add the relevant command to the Quick Access Toolbar in the position that matches the keyboard shortcut you want that command to have. Excel assigns the keyboard shortcut following the rules explained above. There are several different methods you can use to add commands to the Quick Access Toolbar. Since this blog post isn't about the Quick Access Toolbar itself, I only explain 1 of these methods below. Method #1: Right-click on the Quick Access Toolbar or the Ribbon, and select “Customize Quick Access Toolbar…”. Method #2: Click the Customize Quick Access Toolbar button (which appears at the right-end of the Quick Access Toolbar) and select “More Commands…”. Method #3: Go to the Backstage View (by clicking on “File”) and select “Options” on the left-side of the screen. Once the Excel Options dialog is displayed, select the Quick Access Toolbar tab on the left-side of the dialog box. Keyboard Shortcut #1: Alt + T + O + Q. Keyboard Shortcut #2: Alt + F + T + Q. You can choose from more than 1,000 commands to add to the Quick Access Toolbar. That's quite an overwhelming amount. Fortunately, Excel allows you to choose from several different subsets of commands to browse. Step #1: Expand the Choose commands from: drop-down list that appears on the upper left part of the Excel Options dialog. Step #2: Once the drop-down list is expanded, choose any of the different subsets that are listed. The list normally includes the following categories or subsets: Popular Commands (shown by default) Commands Not in the Ribbon, All Commands, Macros, commands from the Backstage View (File tab) or a particular (main) Ribbon tab (Home, Insert, Draw, Page Layout, Formulas, Data, Review, View, Developer and Add-ins), commands from contextual tabs related to a particular tool or feature (SmartArt, Charts, Drawing, Picture, PivotTables, Header & Footer, Tables, PivotCharts, Ink, Sparklines, Timelines, Slicers, Search, Query and Equations), or commands from the Print Preview and Background Removal tabs. Once you've chosen the subset of commands you want to work with, the actual commands you can choose to add to the Quick Access Toolbar are displayed in the Choose commands from list box. This appears on the left side of the pane, just below the Choose commands from drop-down list. Step #1: Select the command you want in the Choose commands from drop-down list. Step #2: Click on the Add button in the center of the Excel Options dialog. Once you've added a command to the Quick Access Toolbar, the command (usually) appears at the bottom of the Customize Quick Access Toolbar list box on the right side of the Excel Options dialog. As I explain above, the exact keyboard shortcut assigned to a particular command depends on its location in the Quick Access Toolbar. Therefore, you can determine (within a certain limited scope) what is the keyboard shortcut for the commands you add to the Quick Access Toolbar by placing them in the appropriate position. To change the position of commands within the Quick Access Toolbar, use the Move Up or Move Down arrows that appear on the right side of the Excel Options dialog. Click on the appropriate arrow as many times as required in order to place the command in the position you desire. Once you're done with the 4 steps above, simply click on the OK button on the lower right corner of the Excel Options dialog box to complete the process. The resulting Quick Access Toolbar displays any new commands that you've added by following the process described above. If you've completed the 5 steps above, you've created a custom Excel keyboard shortcut. Let's take a look at a practical example. The following image shows the full process of creating a keyboard shortcut for the Paste Values command using the 5-step process described above. In this particular case, I place the command in the first position of the Quick Access Toolbar. Therefore, the keyboard shortcut assigned to Paste Values is “Alt + 1”. The following image shows how the Quick Access Toolbar looks like after the process above has been completed. Notice how the newly added command appears at the beginning of the Quick Access Toolbar and is paired with the number 1. The information within the previous sections in this Excel tutorial allows you to execute a huge amount of commands. However, you'll soon notice that, in several cases, a particular keyboard shortcut leads you to a dialog box. This section explains how you can use keyboard shortcuts to interact with most dialog boxes within Excel. As a general matter, you can use Hotkeys to interact with dialog boxes within Excel. I introduce Hotkeys at the beginning of this Excel tutorial. You can generally recognize Hotkeys within a particular dialog box because Excel underlines the corresponding letter. Working with Hotkeys is quite straightforward and, to a certain extent, is similar to working with the Key Tips that help you with Ribbon and Quick Access Toolbar keyboard shortcuts. Let's start by taking a look at a dialog box and its Hotkeys. The following screenshot shows the Format Cells dialog box, with the Alignment tab selected. The arrows point to some of the underlined letters within this dialog box. To select a command using keyboard shortcuts, press the relevant Hotkey. In some cases, you have to press the relevant Hotkey plus the Alt key. In other words, the keyboard shortcut may be of the form “Alt + Hotkey”. If (i) the dialog box you're working with doesn't have tabs and (ii) the current selected option isn't a drop-down list or a spinner control. The Paste Special dialog box that I show at the beginning of this blog post doesn't have tabs, drop-down lists or spinner controls. If the dialog box you're working with has tabs, but (i) the current selected option is within the tab in which the relevant Hotkey appears and (ii) that current selected option isn't a box or a spinner control. In other words, it isn't enough that the displayed tab is the one you want to work with. The current selected option must be one of the commands within the tab. Even though it isn't required in these situations, you can anyway press the Alt key at the same time as the relevant Hotkey. The result generally doesn't change and Excel usually takes you to the same option as if you hadn't press the Alt key. The current selected option within a dialog box is a list box or spinner control. The dialog box has tabs and the current selected option isn't within the tab in which the relevant Hotkey appears. Knowing which is the current selected option may be a little bit tricky in some cases. In most cases, particularly if the current selection option is within the displayed tab, Excel shows a dotted square around the current selected option. In such a case, if you wanted to wrap the text, you just need to press W (the Hotkey for Wrap text). Compare the images above with the one below, where there are no dotted lines to be found. In this case, even though the Alignment tab is displayed, the current selected option isn't within the Alignment tab. The selected option is, actually, the Alignment tab itself. In this case, the Hotkeys continue to be the same. However, you must press the Alt key at the same time as the relevant Hotkey. In other words, to wrap the text, you press “Alt + W”. When working within dialog boxes, you generally have to confirm your choice by pressing the Enter key. As I explain below, Enter is the equivalent of clicking on the default button of the dialog box. Usually, the default button of a dialog box is OK. Most dialog boxes within Excel have clearly marked Hotkeys for almost all of their commands. However, you may eventually notice not all options within a Dialog Box have an underlined letter. 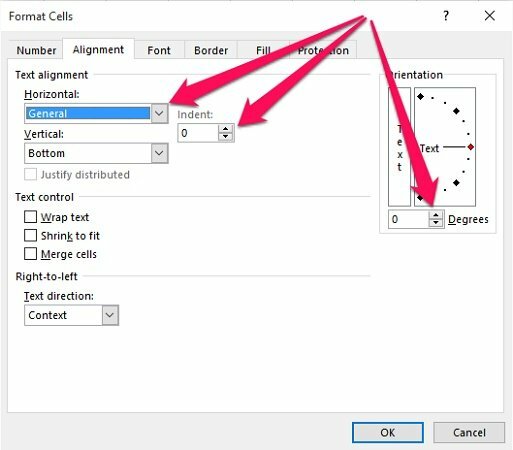 In fact, several of the dialog boxes I show within this Excel tutorial have at least 1 such option, where no letter is underlined. The lack of an underlined letter doesn't necessarily mean that you can't interact with such an option using your keyboard. Alt + T + O + Q.
Alt + F + T + Q. The first 3 components of each of these keyboard shortcuts open the Excel Options dialog box. In other words, “Alt + T + O” and “Alt + F + T” make Excel display the Excel Options dialog. The letter G takes you to the General tab, making the full keyboard shortcut “Alt + T + O + G” or “Alt + F + T + G”. The letter F displays the Formulas tab. Therefore, the full keyboard shortcut is “Alt + T + O + F” or “Alt + F + T + F”. N displays the Number tab. A full keyboard shortcut for going to the Number tab is, therefore, “(Ctrl + 1) + N”. As a side note, “Ctrl + 1” is a basic shortcut for opening the Format Cells dialog box. F takes you to the Font tab. In this case, a full keyboard shortcut is “(Ctrl + 1) + F”. To choose an option, press the first letter of its label. However, if 2 labels begin with the same letter, this rule doesn't work for all of those options. After all, the same key shouldn't lead to 2 different consequences. In this case, the letter A works as a keyboard shortcut for the first tab (Advanced). In other words, the keyboard shortcuts “Alt + T + O + A” or “Alt + F + T + A” take you to the Advanced tab of the Excel Options dialog. Alt + T + O + A + A.
Alt + F + T + A + A. The previous sections of this Excel tutorial cover keyboard shortcuts that allow you to work with a huge range of commands, options and features. There are, however, some cases where you may prefer (or need) to navigate through Excel's interface using other (more common) navigation keys, such as the arrow keys. The following is a list of some general rules and examples of how you can navigate through Excel's interface using the keyboard. Alt and “Alt + Down Arrow”: When a drop-down list is currently selected, you can use “Alt + Down Arrow” to expand the list. Alt, by itself, closes (or contracts) the expanded drop-down list. Some drop-down lists, however, don't require that you press “Alt + Down Arrow” to expand. You can expand them by using the Down Arrow by itself. 1 example of such a list is the Font Face drop-down list in the Home tab of the Ribbon. Arrow Keys: You can use the arrow keys for navigation purposes in several situations. For example: (i) within the Ribbon, arrow keys allow you to move to the next (right) or previous (left) option or tab or (ii) within a drop-down list (such as that displayed above for Font Face), the arrow keys help you move between the different items. “Ctrl + Tab” and “Ctrl + Shift + Tab”: When working with a dialog box that has more than 1 tab, “Ctrl + Tab” takes you to the next tab. “Ctrl + Shift + Tab” takes you in the opposite direction, to the previous tab. Enter: Within a dialog box, Enter generally performs the action that corresponds to the default command button of the respective dialog box. For example, in the Excel Options and Format Cells dialog boxes used as examples further above, Enter is the equivalent of pressing the OK button. Esc: When working with a menu, sub-menu, dialog box or message window, Esc cancels the commands and closes the relevant menu, sub-menu, dialog or window. Esc is also useful for purposes for going back to the previous “level” of the shortcut. For example, if you use the Ribbon keyboard shortcut “Alt + H”, Excel displays the Key Tips for the Home tab of the Ribbon. Pressing the Esc key takes you back one level. Excel now displays the Key Tips corresponding to the Ribbon tabs and the Quick Access Toolbar. Home and End: When a menu or sub-menu is visible, you can use the Home or End key to select the first or last command within the menu or sub-menu. Spacebar: When working with a dialog box, you can use the Spacebar to perform the action that corresponds to the selected button, or select/clear a particular checkbox. When working with the Ribbon, the Spacebar activates the current selected command or, if the current selection is a menu or gallery, expands the selected menu or gallery. Tab and “Shift + Tab”: Tab has a similar effect regardless of whether you're working with the Ribbon or a dialog box. In both cases, it allows you to move the next option or option group. “Shift + Tab” allow you to move in the opposite direction, to the previous option or option group. Macros are sequences of instructions that you want Excel to follow in order to achieve a purpose. Macros allow you to automate a particular aspect of Excel. I cover the topic of macros in several posts throughout Power Spreadsheets. In this particular tutorial, I explain how you can execute a macro by assigning a keyboard shortcut to a macro that already exists. If you're using the macro recorder, you can also assign a keyboard shortcut to a macro upon creation. Method #1: Go to the Developer tab and click on “Macros”. Method #2: Use the “Alt + F8” keyboard shortcut. The Macro dialog box displays most (although not all) of the Sub procedures that are available. More precisely, the Macro dialog only displays public procedures. Once Excel displays the Macro dialog box, select the VBA Sub procedure you want to assign a keyboard shortcut to and click on the Options… button on the right side of the screen. The following screenshot shows how this looks like. I explain (in detail) the Sub procedures displayed in the Macro name list box (whose purpose is to delete blank rows) in this blog post. Once you've gone through step #2 above, Excel displays the Macro Options dialog. You can use this dialog to assign a shortcut key and (if you want to) a description to the relevant macro. Ctrl + Shift + Letter. Make sure that the keyboard shortcut you want to use isn't assigned by default. Any keyboard shortcuts that you assign to a macro override Excel's pre-existing keyboard shortcuts. As a consequence of this, if you assign a keyboard shortcut that is exactly the same as a built-in one, you'll be disabling the built-in shortcut. For example, “Ctrl + X” is the built-in keyboard shortcut for the Cut command. If you assign the keyboard shortcut “Ctrl + X” to a macro, you can no longer use that keyboard shortcut to cut. Once you've assigned the keyboard shortcut to the macro, click the OK button on the lower right corner of the Macro Options dialog box to complete the process of creating the macro keyboard shortcut. Next time you press the relevant keyboard combination (“Ctrl + Shift + M” in the example above), the relevant macro is executed. The main (different) types of keyboard shortcuts you can use when working with Excel. Some methods you can use to create custom keyboard shortcuts. Several different lists and cheat sheets with keyboard shortcuts for Excel. If you start implementing this knowledge, considering the approach I suggested at the beginning of this blog post, you're like to dramatically reduce your reliance in the mouse while working with Excel. This, in turn, will improve your speed and productivity in a consistent manner. So go ahead and start (or continue) the process of becoming an Excel keyboard ninja and saving time. Click on any of the images below to purchase the book or resource at Amazon. PowerSpreadsheets.com is a participant in the Amazon Services LLC Associates Program, an affiliate advertising program designed to provide a means for sites to earn advertising fees by advertising and linking to Amazon.com.